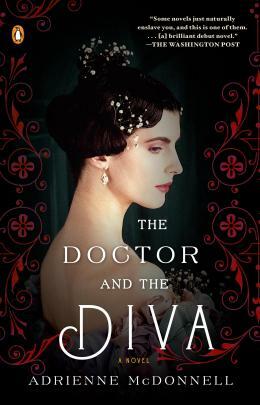 Looking for an absorbing book to read on the night train to Alexandria, I took a chance on the blandly titled The Doctor and the Diva. Opera singer Erika von Kessler dreams of future fame in Italy, but currently she’s the patient of Dr. Ravell, an obstetrician and fertility expert who “finds himself taking an impetuous risk that could ruin them both” (to quote the back cover). It’s historical fiction set in the early 1900s, ranging from Boston (including a scene in the fantastical Isabella Stewart Gardner mansion) to the more exotic locales of Trinidad, Milan, and Florence. The story was inspired by family history—not exactly the author’s but that of her son’s paternal great-great grandmother. The novel has an unusual beginning: Ravell secretly inseminates Erika with his own sperm after discovering that her husband is infertile. It reaches an interesting mid-point, when still-married Erika and Ravell become lovers amidst the tropical splendor of a coconut plantation. The second half of the book follows Erika as she returns to Boston and finally has a baby; several years later, she decides to pursue her singing career in Italy, abandoning her son and her marriage. McDonnell reminds us that in 1910, Erika’s choice of career over motherhood is earth-shattering. They say that truth is stranger than fiction. It’s also much messier and doesn’t always make for a coherent story. But while reading a novel, I want to understand how a character feels about her choices, not merely watch her enact them. The final sections of The Doctor and the Diva unfortunately felt more like a recitation of details than the continuation of a story—as evidenced by shorter chapters as McDonnell tried to cram in all sorts of minutiae (aiming to stay true to the historic record, I assume). As the story twisted to and fro, I lost interest and began to skim toward the ending. By then I’d reached my destination, and no longer needed this initially promising tale of obsession, ambition, adultery, and guilt to wile away the miles.